(Bloomberg) -- We had a relatively quiet session in stock futures overnight and the S&P 500 is poised to open 0.1% higher after clocking the best week since November. The real question is whether the rally that pushed the index to trade just 3.7% away from a record will stick. Interest rate guidance from the Fed on Wednesday will provide the answer to some extent. The biggest-ever deal in the payments industry broke at the crack of dawn when Fidelity National Information Services agreed to buy Worldpay for about $34 billion in cash and stock, sending Worldpay’s shares up 10% pre-market. Exxon Mobil may be volatile Monday after America’s third-largest refinery caught fire in Texas. Boeing sank another 3% before the bell after its worst week since 2016. And General Motors is indicated higher after Trump tweeted that he asked Chief Executive Officer Mary Barra to sell an Ohio plant or "do something quickly." Hedge funds Knighthead Capital Management LLC, Redwood Capital Management and Abrams Capital Management said in a filing late Friday that they united to press PG&E for a leadership change. The funds that together own almost 10% of the outstanding shares want a say in who the new CEO and board of directors will be at the bankrupt utility giant. The problem is that another shareholder, hedge fund BlueMountain Capital Management (owned 1.5% stake as of Dec. 31) has already nominated its own board slate -- 13 candidates that include former California treasurer Phil Angelides, National Transportation Safety Board ex-chairman Christopher Hart and Jeff Ubben, ValueAct Capital Management’s CEO. That sets the stage for a potential fight over the future of the company that’s been searching for a new CEO since Geisha Williams resigned in January, two weeks before the utility company filed for bankruptcy to deal with an estimated $30 billion in liabilities. The utility giant is close to picking new board directors, Bloomberg reported last week, and it probably won’t include BlueMountain’s picks. 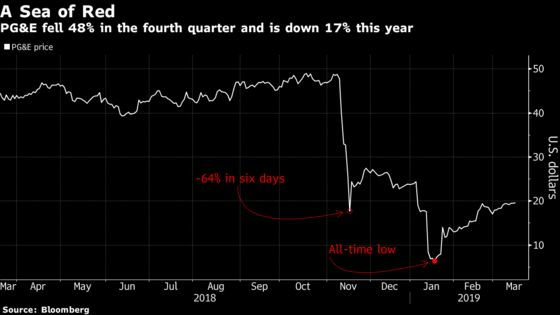 The power struggle among hedge fund shareholders comes as the stock is down 17% this year after tumbling 48% last quarter. Hedge funds hold about 27% of the utility giant, according to data compiled by Bloomberg. PG&E will name its new CEO and board of directors as soon as this week, according to the Wall Street Journal. 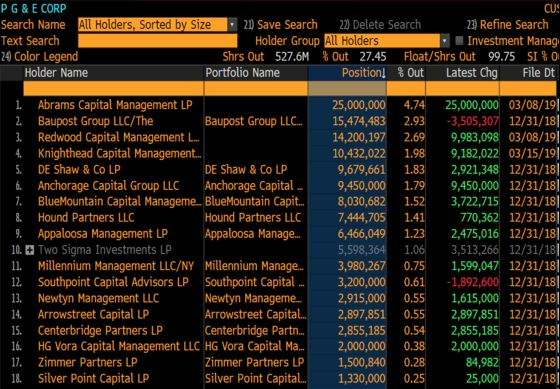 Hedge funds bought 12.8 million shares of the beleaguered company last quarter, with Anchorage Capital and BlueMountain Capital leading the way. The stock is little changed before the bell. We had a good reason to rally on Friday. 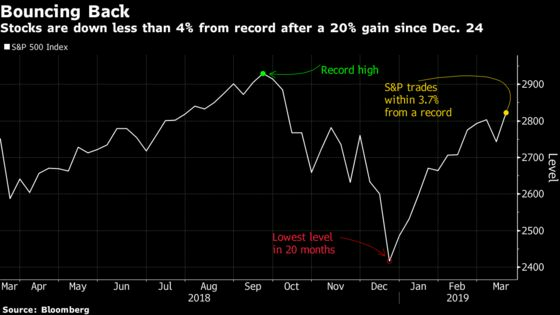 Tech was the clear winner (a 1.2% gain prompted the best weekly jump since November) after strong earnings from Broadcom pushed at least 13 sell-side shops raise their price targets. The firm stood by its revenue forecast, which many on Wall Street didn’t expect to happen amid a slew of uncertainties. Facebook fell the most in the communication services group after the company faced tough questions after a massacre of 50 people in New Zealand was streamed live on the social-media platform. This happened after Facebook’s apps and sites came down on Wednesday and news broke that an investigation by the U.S. Justice Department was broadening to include a federal grand jury in New York. Volumes jumped and trading was volatile Friday amid quadruple witching. The expiration of futures and options on indexes and stocks was likely responsible for a big chunk of the $31 billion inflow into the the U.S. equity exchange-traded funds last week. But the S&P 500’s ascent above 2,815 -- the resistance level it’s been struggling to breach for the past five months -- could mean that some of the inflows were “real” money that will stick. That may open the door for a rally to 2,860-2,900 before any meaningful resistance comes into play, according to Bay Crest Partners’ Jonathan Krinsky. March Madness kicked off as the 68-team field for the 2019 NCAA Tournament was announced on Selection Sunday; Yalies battered by college-scam news got a boost when the Bulldogs beat Harvard 97-85 on Sunday for the Ivy League title, heading to the big dance for the second time in 57 years; Prime Minister Jacinda Ardern’s Cabinet resolved to overhaul New Zealand’s gun laws; NYT reported that Saudi Arabia’s Crown Prince Mohammed bin Salman is said to have authorized a secret campaign to silence dissenters over a year before the killing of Jamal Khashoggi; Gen. Joseph Dunford, chairman of the Joint Chiefs of Staff, said a WSJ report that the U.S. military plans to keep nearly 1,000 troops in Syria is "factually incorrect"; Labour Leader Jeremy Corbyn said if May’s deal is defeated again, his party will trigger a vote of no confidence; Barron’s said in its cover story that it could be premature to sell Boeing shares; violence returned to Paris with the Yellow Vests’ 18th weekend protest; median compensation for 132 CEOs in the S&P 500 reached $1 million a month, the Wall Street Journal said; flooding killed three and a forced thousands from home across the Midwest; and the $25 billion Hudson Yards development opened with fanfare in Manhattan. Watch payments companies after FIS agreed to acquire Worldpay in the biggest international payments deal ever, which comes as a bit of a surprise after a report last week that Worldpay was aiming for S&P 500 inclusion. At $107, Worldpay’s shares are up 10% in pre-market trading, trailing the deal price as of last week’s close ($11 a share in cash plus 0.9287 of a FIS share, worth a combined $112.12), and beating the $97.50 per share Fifth Third was said to have gotten for its remaining stake in the company. Square’s getting a bit of a bounce in pre-market trading, as are Visa and Mastercard. FIS is dropping 1.9 percent. Goldman Sachs upgraded Okta to buy from neutral, seeing tremendous earnings upside potential in the cybersecurity favorite. The company is among the names “with the highest upside to CY20 estimates,” and in a “Blue Sky” scenario, it could top Goldman’s own forecasts by 38%. As part of its same call on software names, Goldman reinstated coverage on Twilio with a buy rating. "We see the greatest level of potential network effects stemming from their platforms," Goldman wrote of Twilio and Okta, "and as such have the highest likelihood of potentially achieving our CY20 Blue Sky scenario." Also on Monday, Berenberg raised its Okta target to $92 from $73, expecting continued growth in its enterprise division.